Lovely quilt and pillow shams. Looks just like the picture and is a welcome refresh of my tired bedroom. Very good quality. This delicately rendered floral toile is classic and fresh in blue on white and offers timeless elegance for your bedroom. The all cotton quilt reverses to a mini print vine coordinate on a blue background that also trims the edges for a neatly tailored finish. Pre-washed for extra softness and comfort, Amberley will be a welcome addition to any bedroom. I have always loved Laura Ashley...had the Sophia set for almost twenty years! I finally decided that I needed to freshen up my bedroom, and this lovely, calming quilt set did the trick. The size was perfect (full-queen) for my full bed. The quality is wonderful! I would highly recommend. Love the soft blue color. It is perfect for my bedroom. It gives the room a very tranquil feeling. Very pleased with size also. Ordered the queen and it covers the high mattress and falls half way down the sides of the bed. Love it! This quilt is light weight and very pretty. It is true to color . I had to return another quilt that looked like the same blue but was not. I am happy with this one and it matched my decor. Highly recommend! The quilt is a soft French blue and sized perfectly. I have had this quilt for several months. Here is what I like about It: washes well w/ minimal shrinkage; the quilt is oversized and drapes nicely on all sides of the bed; I never tire looking at it! It is a perfect summer quilt; For Winter I am adding a white comforter w/ a platinum stitched border to match the quilt because I don't want to put this quilt away for Winter. I bought this beautiful quilt set for my daughter’s bedroom. The quality of the material and the quilting are exceptional. The pattern and the colors are peaceful and just lovely. This quilt set is gorgeous. I can't wait to put it on the bed. Pale blue is my favorite color and this is such a soft blue. It's perfect! The quality of your merchandise is superb. Exactly as pictured!!! I ordered a king for my queen sized bed just to have extra length on the sides. The reverse pattern is also lovely. Appears to be well made. Hoping it holds up after washing. This quilt is a good quality, as it quilt. The pattern adds a fresh clean look to the bedroom . It is comfortable and warm, though not heavy. I thought the quilt was too thin but it wasn’t. Living a apartment, my bedroom is very warm. I can use this quilt every season. I’m glad what I bought. I like the blue color also. Love the quality. he quilt was just what we wanted. Appreciated the fast shipment. 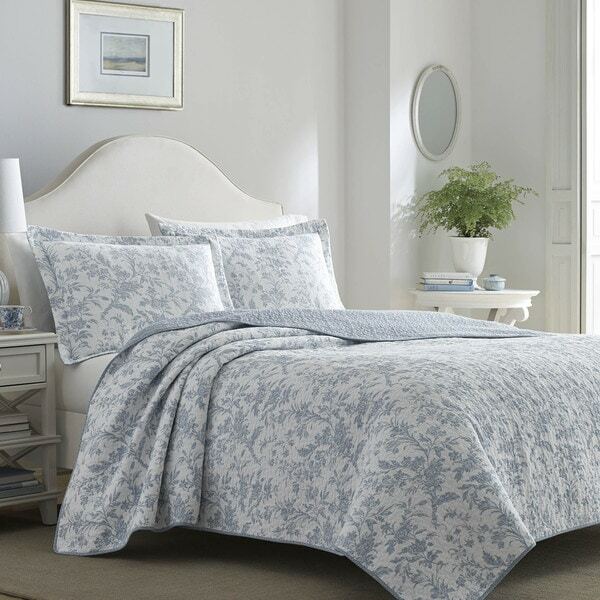 Another quilt set that I have ordered from Overstock. You can not beat the price. Beautiful shade of light blue. Use it in my sunroom when guest come over. Great purchase. Really pretty and good quality. Just perfect in my guest room / love Ashley prints and this quilt is reversible so it offers versatility! Have two twin beds for guests and they look great.. Delivered in two days as promised - thank you Overstock!! Love the soft blue color. Have not washed it yet. Nice quality. This is a beautiful set. Just love it. Soft colors and perfect for our Cottage. "Is the full/ queen still out of stock will you be able to restock it"
"Would an off white or white go with this set"
I would recommend white. I hope it helps. "Any curtains that match the quilt?" "Is it a true white or off-white?" "Does come in a queen size?" Unfortunately, the queen size option is currently out of stock. "Does this come in king size?" Currently, the king is is not in stock- we do not have re-stock date for this item. We apologize for your inconvenience. I love Laura Ashley Quilt Sets. They are so pretty and wear very well.